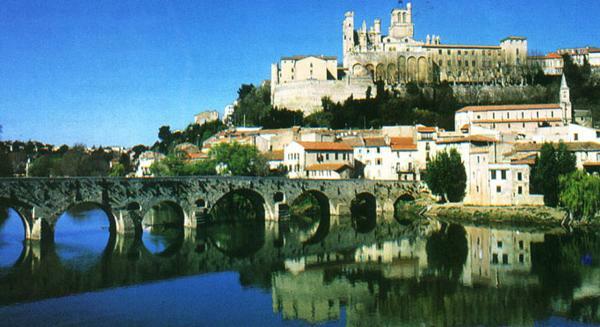 Béziers might be the oldest city in France, founded by the Greeks in the VI century BC. In the Middle Ages it was the Cathare Capital until the terrible massacre in 1209 led by Simon de Montfort land when almost the complete population of Béziers was killed, best illustrated by the famous quote attributed to Arnaud Amaury, abbot and the Pope's legate: "Kill them all and let God sort them out!" Today, living essentially of the local wine production, Béziers is famous for it's wine and passion for rugby and bull-fights. A passion that reaches it's peak during the 5 days of the Feria mid-August (Carnaval atmoshere guaranteed !). The winding streets of the old town end at the impressive cathedral Saint-Nazaire, constructed in the XIV century on the hights of Béziers, offer pretty walks and panoramas. The big square in the town center, Allées Paul Riquet, is borded with outdoor cafés and restaurants and next to Le Plateau des Poètes, a big Park English style. It is also in Béziers that you find the major piece of work of Canal du Midi (classified world heritage by UNESCO): "the nine locks", a staircase of water with a length of 312 m and hight of 25 m.
You can find more informations about the town, events and dates from Béziers tourist office. There is a lot of places to go and visit in the area. Find some suggestions for excursions here.